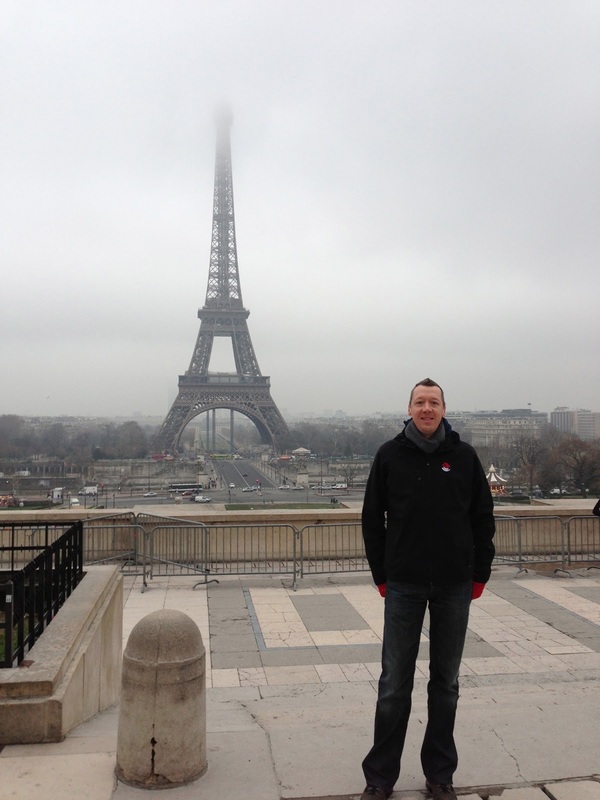 Just back from a four country tour through Europe talking about JBoss Integration products, meeting with customers, meeting with partners, and demoing the various technologies (JBoss Business Rules Management System, JBoss SOA Platform and OpenShift). It was a lot of fun, tiring, and filled with interesting people. 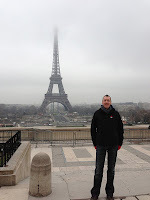 I will try to give an overview of the various cities, events and happenings around JBoss in Europe as I experienced it. 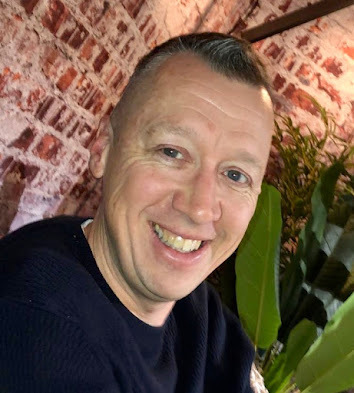 We started on Sunday evening, 20 January with Phil Simpson, JBoss BRMS Product Marketing Manager and myself meeting up in Madrid. It almost went wrong with a sudden snow storm in the area that grounded most air travel from Amsterdam Schiphol airport, but I got out with only a few hours delay. Each location as split into a two day adventure. 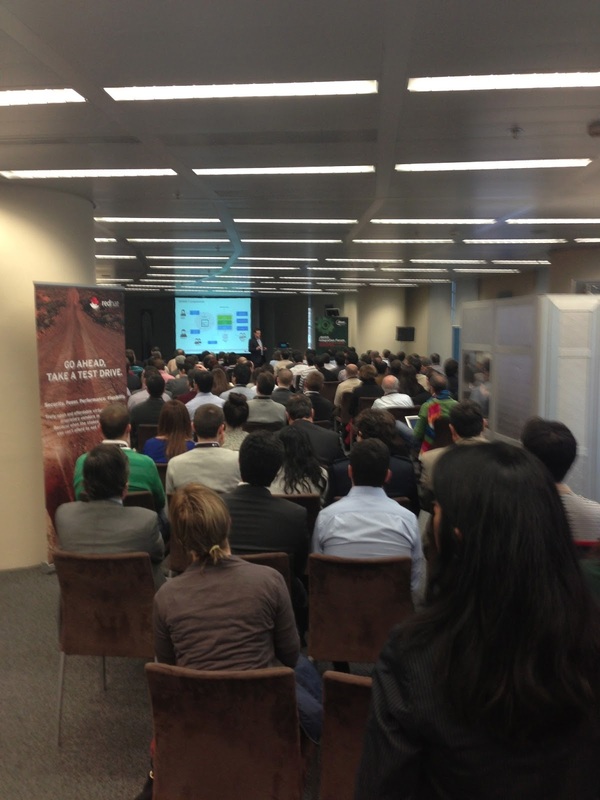 One day being the JBoss Forum with customers invited to enjoy JBoss talks, demos and good food from the local scene. The other day would be spent on local press interviews, customer meetings, partner meeting, and local sales team training sessions. Each country had its own plan around these items and each country was a different experience. The first day started at the local PR offices with press interviews which resulted in an article being quickly published by MuyComputerPRO (translation required if you don't speak Spanish). 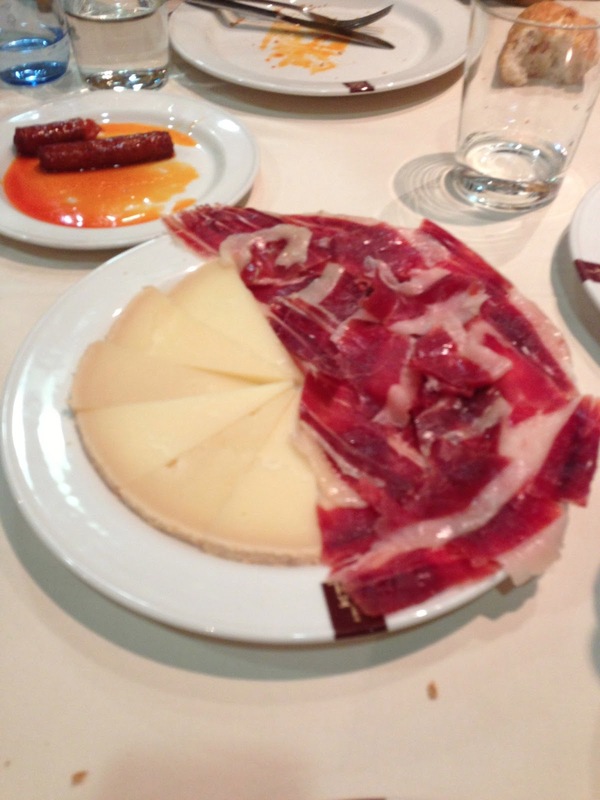 From there we went to the offices of Red Hat in Madrid to conduct another interview via the telephone, then lunch with a local partner and finally a session with the local Sales teams to bring them the latest news on the Integration & BPM front. In the evening we had dinner with the local team and they showed us how to eat Spanish beef, with one guy who will remain anonymous actually finishing off a 600 gram steak! Over full room in Madrid. The second day was filled with the JBoss Forum. Initial the plan was to host a small event, but the attention it got resulted in room reservations having to change to the largest setup the hotel had. Even with Madrid having full on snow flurries, which everyone kept apologizing for and stating that it only happened once a year, we ended up bringing in more chairs to accommodate the ~140 attendees. There was a live translator (see the silver box in the room where translator sat) and about half of the attendees were listening in on headphones to catch our talks in their native languages. The translator asked us to speak in a steady pace, not too fast but not too slow either, which can be a bit confusing if you have a strong accent in your English. 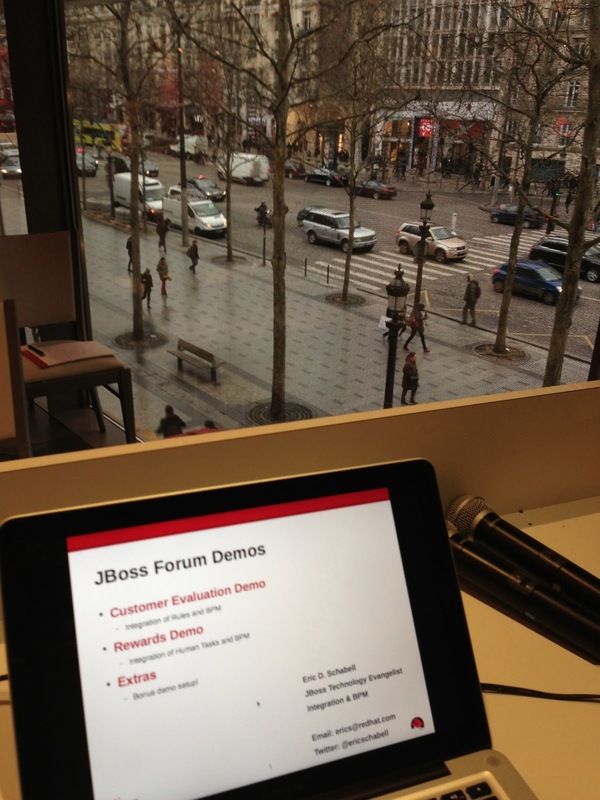 I ran the JBoss BRMS Customer Evaluation demo and the JBoss Rewards demo in my session. Pilar Bravo ran a session demoing the new Optima Planner product which went over very well. As the attendees finished the day up on the top floor of the hotel with drinks and food, Phil and myself headed for the airport to continue this adventure in France. Travel went smoothly this time, we arrived in Paris and the hotel was at a great location, just off the Arc de Triomphe at the head of the Champs-Elysees. 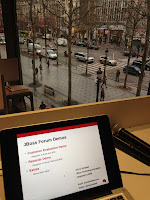 The next day the JBoss Forum event was held on the Champs-Elysees just one floor up with the window next to the attendees giving you a great overview of the finish to the Tour de France. With ~95 attendees this was again a standing room only event and I demonstrated not only the JBoss BRMS Customer Evaluation and Rewards demos, but also the new Home Loan demo with BPM capabilities (blogging this new project soon). This Home Loan demo leverages both JBoss BRMS and the JBoss SOA Platform to integrate services, ESB, BPEL, rules and BPM. 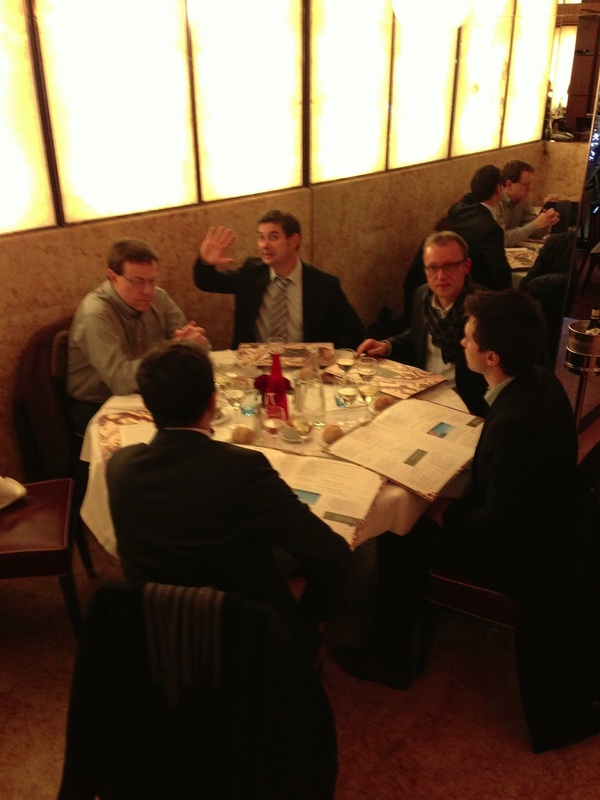 Again, in the evening we had dinner with some of my oldest JBoss friends and enjoyed some really nice French dining. It was nice to catch up with old friends and meet some new ones! The second day gave Phil and myself the chance to wander a bit in the morning for breakfast and to get to the office for our Sale Team training session. It would not be proper to visit Paris and not get a shot of the Eiffel Tower. After our training session we headed off to enjoy our weekends before having to head out to Germany for week two of this tour. 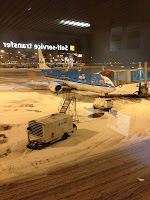 Sunday evening flights got both Phil and myself into Munich, Germany with no delays nor much snow to worry about. It had been warming up a bit so most of the snow was melting. 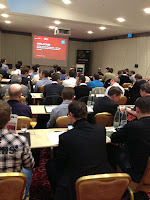 The JBoss Forum event in Munich was again completely full with ~90 attendees. 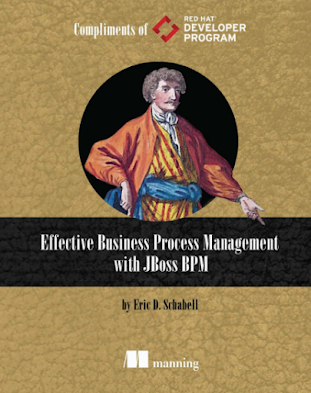 We even had attendees drop in from another event in the same building that turned out to be from our competitors, guess they were interested in JBoss Integration & BPM. Throughout the day there were several press interviews so watch for German language JBoss articles coming soon. Late flights for both Phil and myself got us into Zurich late, but the weather there had warmed up enough to melt all snow. Can you believe it? A lack of snow in Switzerland, who would have expected that in January? 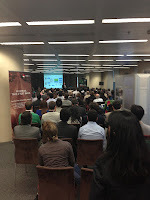 The first day here was the JBoss Forum with customers and interested parties. This took place in a hotel down by the river in the center of Zurich and was very well attended. Not a single empty chair. I again showcased the JBoss Customer Evaluation and Rewards demos focusing on the business interaction with the Business Rules Manager and BPM web tooling. There were several attendees that approached me afterwards about how nice it all looked. The evening was again a team dinner with a local partner joining us to discuss eventual content for the partner workshop I was to give the day after. Phil Simpson traveled on to Geneva for a last JBoss Forum the next day. The final day was a workshop for partners with ~10 attendees. 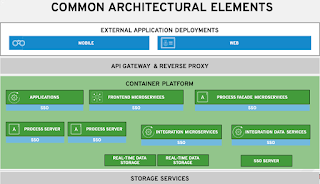 We ran through an OpenShift Primer session based on the book at their request which focused on JBoss Integration & BPM examples in the Cloud. The first participant to get an application onto OpenShift won an USB bottle opener! Next we took a detailed look at the JBoss BRMS demos given in the JBoss Forums. Each attendee was given a chance to install the demo locally during the workshop. Finally, we finished up with the Home Loan demo project and installed that locally for the attendees. Travel home that evening was without hinder so the two week tour wrapped up nicely with memories of customer, partners and colleagues we had chatted with around Europe.